March Report by Dr. Campaign Limo During March, the Mara region received a few sporadic showers of rain, however, most of the days were dry with diminishing forage and water for use by wildlife. 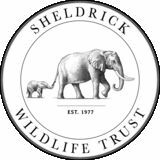 Cases handled during the period involved elephant treatments with one big male relieved and treated for a wound caused by a tight cable wire snare round his trunk. Other elephants were treated for human induced injuries but all of them were considered out of danger. Acknowledgement The Mara Mobile Veterinary unit would like to thank all stakeholders who assisted in one way or the other while attending to these cases. Thanks to Minara foundation through SWT for their facilitation and support to the unit. Thanks too to KWS management for their guidance and technical support. This big bull who was in company of the previously treated bull was spotted with a spear wound on his right rump. Examination revealed a freshly lodged poisoned arrowhead which was barbed. This young calf was part of a herd of elephants who had crossed the Mara River into a nearby farming community and eventually driven back to the conservancy by Lemek Conservancy, Mara Elephant Project and KWS rangers. In the process, this young calf lagged behind and was unable to climb up the river bank. The teams assisted him after manually restraining him with ropes, but since his family, which was known, had gone some distance, he was put in a vehicle and taken to where his family was. The mother charged at the releasing team when she saw her calf and the rangers were unable to fully remove the rope before the calf took off, rejoining his mother. Capture and Removal of the Rope The family was traced to a small thicket within the Conservancy and were gently driven out into an open area. The mother was very aggressive and protective of the calf. The team decided to immobilize the mother and restrain the calf manually after pushing the other family members a short distance for the safety of team members. It took eight minutes for the drugs to take full effect; the mother assumed left lateral recumbency and the calf remained close to the immobilized mother. He was manually restrained and the rope removed from the right hind limb. The mother was then reversed with 42mgs Diprenorphine hydrochloride and together with the calf joined the patiently waiting family. This bull was seen by Olarro Conservancy Rangers with a tight snare round his trunk. The Vet Team found him with an equally big bull that had a spear injury on his rump and was also treated. A big herd of elephants were browsing peacefully close by. Immobilisation, examination and treatment Restraint was achieved chemically by use of 17mgs Etorphine hydrochloride delivered through a 3ml Dan-inject dart from a vehicle. It took ten minutes for the drugs to take full effect with this elephant assuming left lateral recumbency. Examination revealed a tight cable snare around his trunk with partial perforation of his right nostril. The snare was cut loose and released with the resultant septic wound being debrided with help of Hydrogen peroxide and sterile gauze swabs. Clean water was used for rinsing before tincture of Iodine was applied for disinfection. Oxytetracycline wound spray was also applied topically. Other treatments given include parenteral administration of Amoxicillin antibiotics and Flunixin meglumine anti-inflammatories. The small perforation into the nostril is expected to close as the wound heals. Prognosis He rose up within three minutes of reversal and retreated to a nearby thicket. Prognosis for recovery is good. This big bull who was in company of the previously treated bull was spotted to be having a spear wound on his right rump. A team was tasked to keep an eye on him while the first bull was being treated for eventual immobilization and treatment. Immobilisation, examination and treatment The elephant was immobilised with 17mgs Etorphine hydrochloride delivered through a 3ml dan-inject dart. Darting was done from a vehicle with the drugs taking full effect after eight minutes. This elephant assumed right lateral recumbency. Examination revealed a fresh spear wound, less than 24 hours old and about ten inches deep, on his right rump. This wound was flushed with clean water and wiped dry with gauze swabs, after which tincture of Iodine was used to disinfect the wound. Cloxacillin antibiotic was infused before Oxytetracycline spray was applied. Other treatments given included parenteral administration of Amoxicillin antibiotic and Flunixin meglumine anti-inflammatory. Prognosis Prognosis is good. He woke up three minutes after reversal and moved away. This baby elephant was spotted the previous day browsing alone with no elephant family nearby. A team of rangers were tasked to monitor this calf to provide security and confirm his status. A decomposing carcass of an adult female elephant had been found near this location three days earlier raising the possibility that this calf was hers and had been orphaned. Rescue On the day of rescue, a passing by family of elephants comprising of one mother with three calves, one still suckling, briefly joined this calf. The encounter was friendly but brief as they moved on after a few minutes leaving this calf alone. Given the age of this calf and presence of large carnivores within the conservation area, the teams felt this calf had to be rescued to have any chance of survival. At his age in the wild he was eventually going to die of malnourishment if he survived predation. He was calmed by use of 50mgs Azaperone tartarate delivered through a 1.5ml dan-inject dart, from a vehicle with the drugs taking full effect after ten minutes. He was then restrained manually before being loaded onto a padded truck. This baby elephant was picked at Olkiombo airstrip by plane and taken to Sheldrick Wildlife Trust elephant orphanage in Nairobi. . This adult male, a member of the famous 5 musketeers creating big tourist attraction in Mara. was seen injured by tour guides and Reserve rangers and called the mobile veterinary unit for help. The injured was reported to be the biggest and leader of the coalition. Immobilisation, examination and treatment Restraint was achieved chemically by use of a combination of 1.6mgs Medetomidine and 130mgs Ketamine delivered through a 3ml dan-inject dart. It took seven minutes for the drugs to take full effect after which he was blindfolded and taken to a nearby shade. After being placed in a comfortable position and posture, examination was conducted. He had a severe injury to his perineal area with the left testicle hanging out. This could have been caused by being stepped on or gored by prey while making a kill. The wound was washed clean with water, wiped with sterile gauze and disinfected with surgical spirit. The spermatic cord was double ligated with absorbable suture before the hanging testicle was excised. All bleeders were arrested. Tincture of Iodine and Cloxacillin ointment were applied to the wounds for disinfection, and as antibiotic, respectively. Prognosis Good. This giraffe bull was seen the morning of this date by Olarro Conservancy rangers with an arrow head sticking from his withers. They called the Mobile Veterinary unit for help. He was a big mature bull in a herd of ten giraffes browsing within the Conservancy. He appeared irritated due to the discomfort caused by the lodged arrow head. The arrowhead was visible from a distance. Immobilisation, examination and treatment Examination revealed a freshly lodged poisoned arrowhead which was barbed. The arrowhead was gently pulled out and the resultant wound flushed with copious amount of water to remove as much of the poison as possible. Hydrogen peroxide was used for debriding and sterile gauze was used for swabbing and removal of debris before rinsing with clean water. After wiping it once again with sterile gauze, tincture of Iodine and Cloxacillin ointment were applied for disinfection, and as an antibiotic, respectively. Other treatments included parenteral administration of Amoxicillin antibiotics and Flunixin meglumine anti-inflammatories. Prognosis He was then released and he rose up and galloped to join the herd. Prognosis for recovery is good. This young female was reported stranded and wandering around by local administrators within the county. The administrators raised concern regarding her safety given that some villagers had complained that she had destroyed their crops. 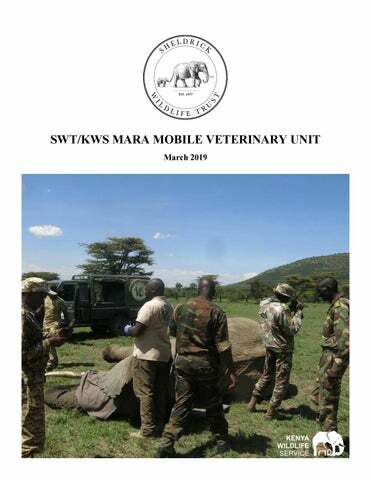 The Mobile Veterinary Unit together with the local KWS staff decided to capture and relocate her to a suitable conservation area to avert potential conflict. Capture and Relocation This young female was traced to a village in the county having formed a bond with a domestic donkey. After a brief discussion with the villagers and administrators to explain the action to be taken, she was restrained chemically with 5mgs Etorphine and 1mg Medetomidine delivered remotely trough a 1.5ml dan-inject dart from foot. The drugs took effect after four minutes and she was stabilized before being placed on the back of a truck on sternal recumbency for relocation. She was constantly monitored during transit with additional sedation of Medetomidine to calm her. She was eventually released in Oloisukut Conservancy with another zebra herd after the anaesthesia and sedation were reversed. She woke up within one minute of reversal to mingle with the new herd.